Whew. I finally finished reading The Well of Loneliness. This isn’t the first time I read it, but when Cass of Bonjour, Cass! suggested we read it for pride (finished a little late), I was all for tackling this classic lesbian tome. Once again, I must reiterate: don’t let this be the first lesbian book you read! It’s way too depressing for someone first coming out. Read a nice HEA book first. This was also the first book I’ve read that I took extensive notes through, so you’ll be hearing a lot about it. Cass and I are also going to discuss it at some point and post the conversation on both our blogs. The Well of Loneliness (WoL from now on) takes on the majority of Stephen Gordon’s life. One of the ongoing questions I had while re-reading WoL was weather this was a story about a lesbian, as it has been traditionally interpreted, or a transgender story. This was published in 1928, so there wasn’t really the language to describe it that way at the time. I’m not entirely sure how it should be classified (or whether it’s appropriate to apply 2010 terms to a 1928 story at all), so I’d love to hear your interpretations. I hate scenery descriptions in books, so that’s just a personal preference, but man is that a sprawling, overwrought sentence. It’s no wonder it’s so hard to pick up this book; that sentence would turn anyone away. Luckily, the whole book isn’t written like that. Part of the evidence for WoL being a trans novel is that both Stephen’s parents desperately wanted a son (not unusual for the time) and while Anna was pregnant with Stephen, she was convinced Stephen was a boy. They started calling the unborn son Stephen and kept the name even when Stephen turned out to be female. Stephen is also constantly described as looking exactly like her (using the pronouns used in the book) father. This is not a happy novel. We’re only a couple pages in when we realize that Stephen’s mom resents her (as an infant onwards) for some reason, possibly because Stephen gets too much attention from her father. WoL is never a chipper book, not even in title, so it shouldn’t be too surprising, but still. This is the part of WoL that’s depressing: it’s still relevant. 82 years later, Hall still addresses issues we’re facing today. In fact, WoL takes a firm “born that way” stance; Stephen is only seven when she starts crushing on one of the female servants. On the trans side of things, Stephen dresses up as a boy constantly, taking on the persona of Nelson. She also says “I must be a boy, ’cause I feel exactly like one” (pg 20). A little later on that same page, Stephen is described as loathing dresses and any feminine clothing, and “she was conscious of feeling all wrong, because she so long to be someone quite real, instead of just Stephen pretending to be Nelson.” A couple pages later, she asks her father “Do you think I could be a man, supposing I tried very hard–or prayed, Father?” (pg 26) She also complains later that “being a girl spoil[s] everything” (pg 37). I don’t know how you can’t be completely charmed by Stephen at this age. Actually, at this point her life isn’t so bad, because she’s got all her hobbies and her supportive father, and at this point she doesn’t really notice her mother’s disdain for her. Later, though, Stephen does some very stupid thing. I feel like she doesn’t have enough respect for women. She doesn’t let her lover make her own decisions and handles things in a very paternalistic, “I know what’s best for you” way. She ends up sabotaging herself and her relationships through pride a lot. WoL has many small themes running through it. Her lesbianism/transgender issues, sure, but also her deep love for Morton (where she grew up), her worship of her parents’ relationship, writing, the tragedy of aging, and religion. There are small peculiarities that run through WoL, like the animals (and the occasional tree and sometimes houses) having real, articulate thoughts that they are just unable to communicate to humans. Also, looking bad, the amount of times the word “queer” comes up is entertaining. The Well of Loneliness is not that long a book; it’s only about 450 pages, but it feels long. It feels like an autobiography of Stephen’s entire life, partly because you can’t help but think Stephen is based heavily on Radclyffe (I mean, Stephen is even a writer). It all seems so deeply personal: all of the emotions are intense and immediate. One small thing: something I hate about reading books written way back is the surprise racism. Everything’s going along fine, and… surprise racism. WoL has it. Including “work like veritable n*ggers” (pg 288) and “His eyes had the patient, questioning expression common to the eye of most animals and to those of all slowly evolving races” (pg 362). Luckily, it’s only one scene, but that is ridiculously cringe-worthy. To finish up, I wanted to reiterate how many of the issues we’re still discussing today are covered in this book. It’s been eight decades and we’re still trying to tackle the same old problems. DADT? Stephen wants to help in the war effort and is afraid of being turned away. Her and other “inverts” join and drive ambulances, an extremely difficult and dangerous job. She discusses how this is one of the few arenas that “inverts” can feel like participants in their own country, can crawl out of the darkness and live with the rest of the world. And the US is still not letting gay people serve openly. One of the central concerns in WoL is Stephen’s desperate want to provide for her lover a marriage and children, the respect that is inherent in that relationship, and the powerlessness of not being able to give that protection. And we’re still having that discussion, 82 years later. 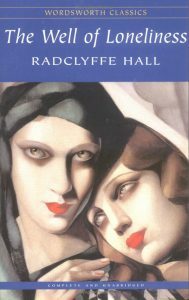 Have you read Well of Loneliness by Radclyffe Hall? What did you think of it? Do you think WoL is more of a lesbian or trans novel, or is there a problem inherent in the question?